Welcome to the second edition of Wedding Wednesday where Rebecca of Tastefully Entertaining and I take one invitation from FineStationery and give you two different interpretations! Today's Wedding Wednesday was a tough one for me. Pink and black for a wedding - no problem. Images for a bridal shower... a bit more difficult to come by. 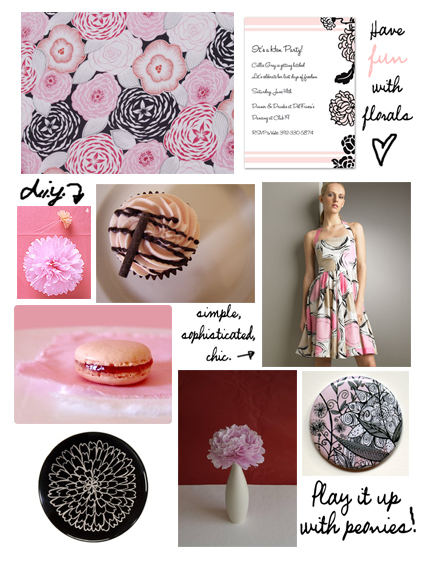 The basis for today's inspiration board is this pink, black and white bridal shower invitation from Toccare. As I said, I was having a little trouble finding things that weren't ultra-formal yet still suitable for a shower. I started where I often do - looking for tasty treats. This little pink cupcake is obviously pink and brown but how could I refuse that presentation? I know I tend to obsess over cupcakes so I included this delicious macaroon found on foodbeam. With dessert out of the way, I was on to what I consider the main course for any event - the decorations. Some tissue paper pom poms a la Martha Stewart lend an airy and whimsical feel to any event. Simple centerpieces like this peony in vase mirror the delicate paper blossoms. For the table top, mix plain black or white serving dishes with some fun designs like this marigold salad plate. Drape a runner featuring vibrant florals over a solid table cloth to add some pop to your look. Fabrics from Alexander Henry come in many wonderful designs and colorways. A fun look for the hostess or guest of honor would be this playful dress from Blugirl. Finally, send your guests home with a stylish and practical gift like this Flora mirror from etsy. Rebecca always seems to find the perfect something for her mood boards. Last week it was the perfect flowers, this week it's the perfect cake. Check out her interpretation of our invitation here and let us know what you think!